Internal Revenue Service (IRS) funding was in the news at the end of last year, after a series of articles by ProPublica detailed just how badly its resources had been gutted by cuts enacted by the Republican-controlled Congress. And the IRS remains in the news with ongoing pressure to release President Trump’s tax returns. Complaining about the IRS is a popular pastime for lots of Americans, and we would certainly agree that in recent years the IRS has spent too much time auditing low-income households—a recent ProPublica story notes, “the IRS audits Earned Income Tax Credit (EITC) recipients at higher rates than all but the richest Americans.” But the IRS needs mended not ended, with a large infusion of resources as well as a reorientation of its enforcement priorities. The reason for not giving up on having a functional IRS is simple: if we want a country where rich people and powerful corporations pay their fair share, we will need a higher-functioning IRS, and we should be willing to pay for it. The chart below shows the substantial budget and employment cuts at the IRS since 1994. IRS operating costs (in 2017 dollars) have declined 29 percent between 1994 and 2017 as a share of total returns filed. 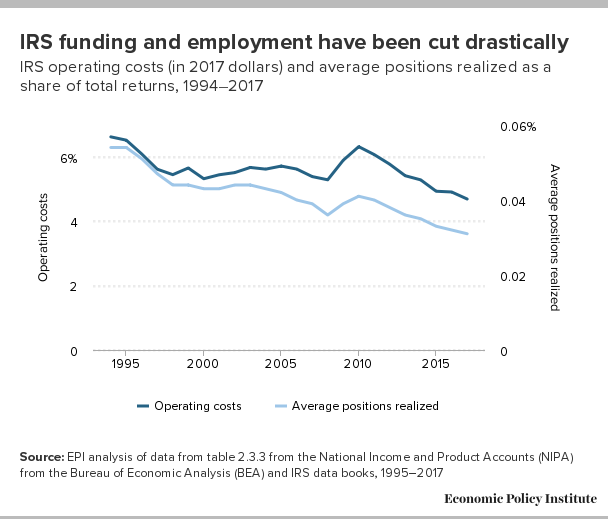 And those budget cuts have real consequences for IRS staffing; full time equivalent employees as a share of total returns filed has fallen by 42 percent since 1994. Since 2011, GAO found that the shrinking IRS workforce has come largely in enforcement, leading to agency officials telling GAO that declining staff was a key contributor to scaled back enforcement activities. Shrinking IRS enforcement is a boon largely for rich individuals and corporations, who have far greater opportunities to dodge taxes through creative accounting. The IRS has not always been so hamstrung. A too-brief spell of increased budget and staff capacity from around 2008 to 2011 led to about a threefold increase in audit rates on households making over $1 million, while audit rates overall increased by just 11 percent, as did audit rates for EITC recipients making under $25,000. Overall audit rates for EITC recipients increased by just 4 percent. In short, when resources were adequate, the IRS (properly) focused its enforcement gaze where the money was. The era of budget austerity has coincided with more suspect prioritization. Budget cuts since 2011 have led to overall audit rates declining by 44 percent since 2011, with overall audit rates on EITC recipients falling 36 percent. But audit rates at the top have fallen even further. Households making between $1 and $5 million saw their audit rates decrease by 70 percent, households making between $5 and $10 million saw their audit rates fall by 62 percent, and households making over $10 million saw their audit rates fall by 51 percent. Audit rates of corporate returns tell a similar story. From 2008 to 2011, overall corporate audit rates increased by 12 percent, but audit rates of small corporations (those with total assets under $10 million) increased by just 7 percent, while audit rates of large corporations (total assets over $10 million) rose by 16 percent. Budget cuts since 2011 have likewise been a boon for large corporations, even as they dodged taxes owed on trillions of dollars of profits booked offshore. Overall corporate audit rates fell by 26 percent and audits of small corporations fell by 28 percent, while audits of large corporations fell by 48 percent. The underinvestment in enforcement is so dire that the Congressional Budget Office actually estimates that increasing IRS enforcement funding would decrease the deficit, as the revenue brought in from greater compliance more than makes up for the increased spending on IRS enforcement. The most recent estimate of the amount of noncompliance, or the gross tax gap, was about 18 percent of total tax liability. To make a real dent in this noncompliance, the decline of IRS budget and staffing capacity must not only be stemmed, but reversed. Going forward we will need a much better-financed IRS who, rather than prioritizing audits of low-income workers, is given an affirmative mission to make the rich and powerful pay the taxes that are legally due. The 2017 GOP Tax Cuts and Jobs Act opened up egregious loopholes in the tax code for the rich and big corporations. In particular, the new pass-through loophole seems tailor-made to exacerbate noncompliance, as the 20 percent deduction will incentivize income shifting from labor income into pass-through business income. Pass-through income actually accounts for the bulk of the overall tax gap, largely because there is no employer reporting wages paid to the IRS. The benefits of tax dodging through this new loophole will, predictably, mostly accrue to the top of the income distribution. 69 percent of partnership income (one key component of pass-through income) is earned by the top 1 percent. And the ability to track these income flows is so poor that even researchers with access to extremely detailed administrative data from the IRS were unable to trace 30 percent of overall partnership income back to an ultimate owner or originating partnership. Besides giving the rich and corporations a cut in statutory rates at the end of 2017, we have been giving them the tools to construct “do it yourself” tax cuts through avoidance for most of the past decades. If we want a country where the rich have to pay their fair share, we have to give the IRS the tools it needs to do its job, and IRS has to focus where the money is.